This presentation was part of a three-day workshop that I delivered to Dayton Metro Library with my colleagues, Cheryl Gould and Sam McBane Mulford. Dayton is remodeling and building new libraries as well as consolidating some of the smaller branches.They have been looking at automated materials handling and RFID as possible technologies to incorporate into their new buildings. Rather than focusing on the requirements of the technology and letting that drive the project, we wanted to help them focus on their core library values and envision how they might change the patron experience for the better. It was an intense three days of very hard work for the group but it went very well. They not only learned more about RFID and automated materials handling (and other self-service technologies) but they also came up with core service elements that they want to see as part of their new service model. They made informed decisions about the technologies they would like to see implemented and they even made a tentative staffing plan. That's a LOT to accomplish in three days! 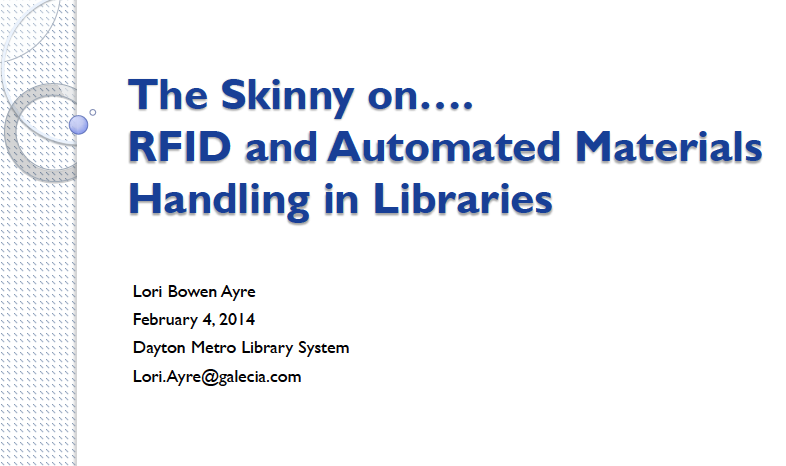 The slides and notes from my introduction of RFID and AMH (PDF) are attached. The slides can be found at Slideshare.